You would like to protect the photos that you post on the web sites or just need to add captions to the pictures of your photo album explaining where and when these photos were taken? 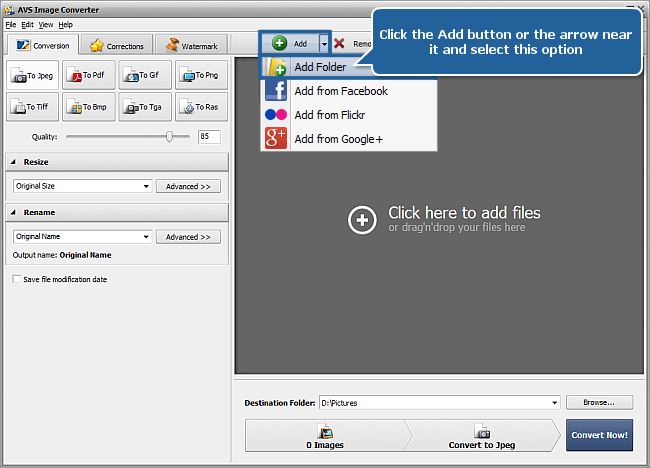 AVS Image Converter will help you perform these tasks. 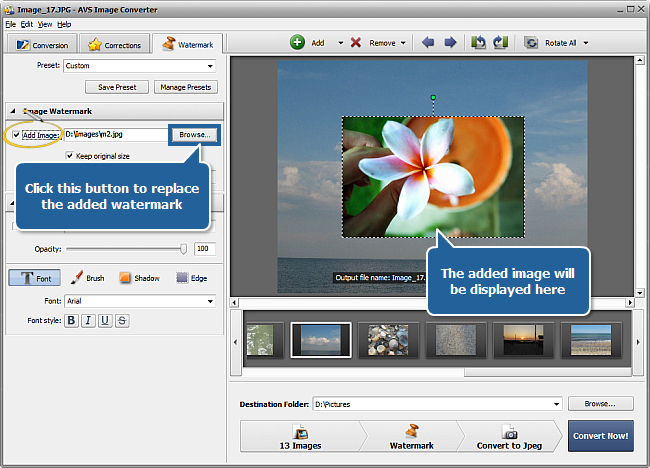 This program allows you to apply a visible text or image watermark to a series of pictures and convert them to one of the supported image formats. Just follow the easy steps listed below. 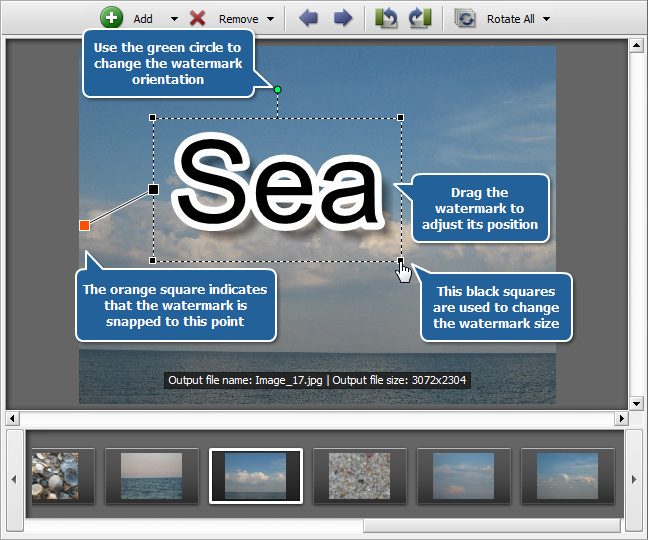 To be able to add some text or image logo you need first to switch to the Watermark tab of the Working Area. 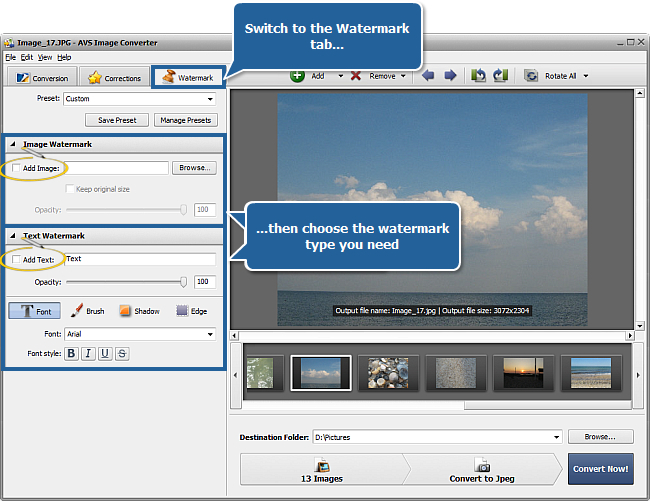 Then select the watermark type you want to apply checking the corresponding control. Note: the selected watermark will be applied to all images loaded into the program. 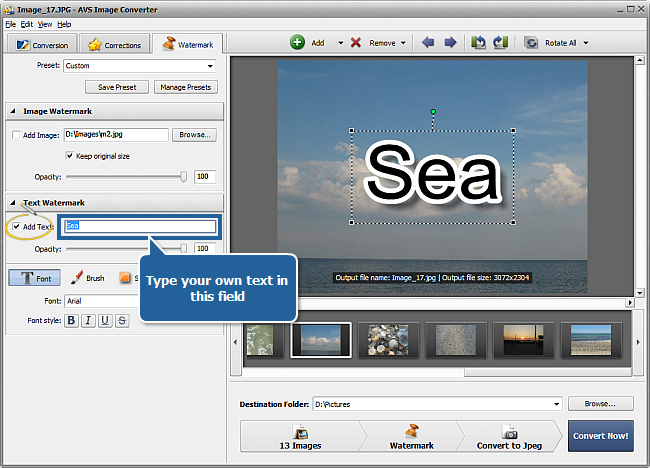 To apply an Image Watermark check the Add Image box. The Windows Explorer window will be opened. Select the needed image and press the OK button. 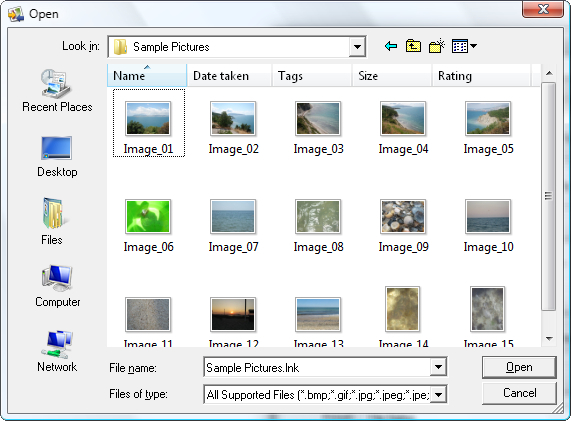 If you want to remove this image and add another one click the Browse... button near the Add Image field, select the appropriate image in the opened Windows Explorer window and press the OK button. The previously loaded image will be replaced. If you would like to add a Text Watermark check the Add Text box at the Watermark tab and type your own text in the Add Text field. By default your image or text logo will be placed in the middle of your pictures. 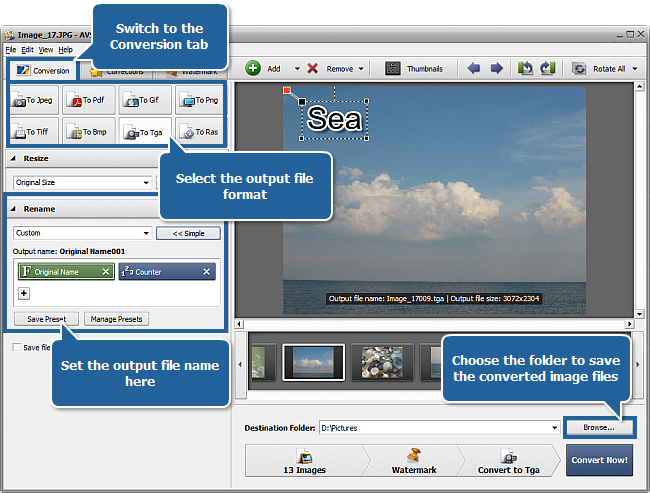 To adjust its position drag it without releasing the left mouse button within the Preview Area. To snap your watermark to one of the image corners or centers of the sides click the large black square adjacent to the needed place - the square will change its color to orange . If you need to change the watermark orientation direct the mouse cursor to the green circle - the cursor will turn to a circular arrow . Hold down the left mouse button and drag it within the Preview Area. To change the watermark size use the little black squares at the corners of your image or text watermark. Move the mouse cursor to one of the squares (the cursor will turn to a pointing hand ) and drag it within the Preview Area. Note: if you want to change an image watermark size make sure that the Keep original size option is deselected in the Image Watermark section of the Watermark tab. If you add a text logo you can also adjust the additional text parameters like font, brush, shadow and edge. Please refer to the Adding Watermark page of the online help to learn more on how to do it. If you want to remove the applied logo deselect the Add Image or Add Text box. 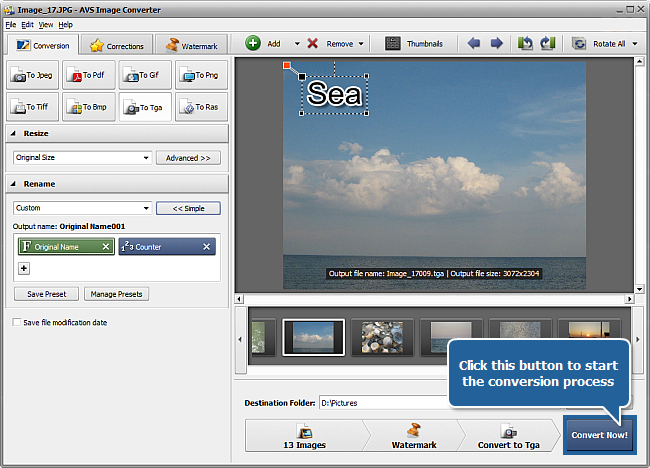 Switch to the Conversion tab and select the output image format clicking the corresponding button. When the conversion is over you can open the folder with your watermarked photos and post them on the web site.